Last week I opened with a tribute to nurses. This week it is to the mothers of us baby boomers. I am very grateful to the folks at the Arizona Daily Star editorial staff for running this. It speaks for itself. My mom died recently after having spent nine days slowly shutting down in hospice. She was 92. Being at her side throughout was heartrending. I have been surprised to learn how many friends have gone through similar times. But this is not an obituary. Nor will it be morose. This is a call to celebrate the lives of our “Boomer Moms.” Theirs has been a uniquely challenging and inspiring journey. Going through mom’s papers after her death, I came across the deed to her house. She was a single mom, raising my brother and me with little help from our dad. She managed her money and put together a down payment that she invested in a small, unassuming house. On the deed it said “Marian Kozachik, a divorced woman.” This was in 1970. She, and all other women of her era were defined by her husband. Even after their separation. When World War II broke out, the young men put on uniforms and went off to war. The young women went out into the workforce and kept the economy going. It was a shift in roles that showed women they had what it took if they wanted to chase dreams that lay beyond the home. That changed when the boys came home after the war and retook jobs, and young women were supposed to go back to their domestic focus. The baby boom followed. For the moms who chose to support their family through work in the home, the opportunity was honorable. There is absolutely nothing demeaning or “less than” about raising a family and managing the affairs of the home. And yet, the expectation was that would be universal, and that the men would resume their “proper” role of provider. Women’s work existed in the home, and venturing beyond violated social norms. But normalizing a return to pre-war roles was like putting the genie back in the bottle. Some women had tasted a new direction for their life and wanted to pursue it. Others, like my mom, had to embrace the role of provider after divorce. Glass ceilings and occupational pigeon-holing were social constructs to effectively keep these non-compliant Boomer Moms in their place. In the ’60s and ’70s we saw efforts at significant social change. That included civil rights legislation, environmental legislation and a general attempt to break down some of the old ways and open new doors. Women took part in those efforts. Even so, the Equal Rights Amendment was one legislative change that was not adopted. When Mom bought her house in 1970, she was still defined by a relationship that had ended over a decade earlier. And to get a loan, she was required to have her former husband’s signature. Boomer Moms’ fight to be equal players continued. Today we see changes evolving. Women are being accepted more and more fully in non-traditional occupations. They are seen more and more running large firms. This past year they made significant gains in holding public office. Glass ceilings are being broken down. And yet, this past year we also saw signs that the hard work our Boomer Moms performed to change perceptions is still a work in progress. The #MeToo movement shouts testimony to the fact that far too often, women are objectified and indeed treated as “less than” in our society. And the ERA is still not the law of the land. My mom, and Boomer Moms across the country have been fighting the social mores that imposed restricted options since the day they were sent back home after the war. Many fought the mold and successfully balanced dual roles – loving and nurturing mothers, and working outside the home in occupations that allowed them to grow more fully as persons. For them all, it was a fight. To the extent they’ve made progress, our sons and daughters are the richer for their service to our country. There is work yet to be done. Today is the time to recognize, and to thank our Boomer Moms, like Marian Kozachik, for having laid the groundwork, and broken down some of the barriers so that hopefully in the not-too-distant future, the ceilings are shattered and persons are free to choose their path, regardless of any of the socially imposed restrictions that have been far too slow in coming down. Find a Boomer Mom – perhaps your own if you still have her – and give her a hug for the hard work she has done to make us better people. Word is that the government shutdown is on a three-week hiatus while the sides try to come to a more permanent set of agreements. 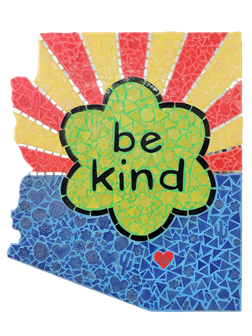 The Be Kind this week is for the many groups around town who have stepped up in support of the workers while they have gone without paychecks. Let us hope that does not resume in three weeks. This graphic is from the Community Food Bank of Southern Arizona website. Throughout the shutdown they’ve done their best to assist the local families in need. Through both their Community Meals and Emergency Food Box programs, the good people at CFB have helped to fill many gaps and serve as a temporary bridge. Tucson Water continued throughout the shutdown to offer 21 day extensions on the payment of water bills. And there has been no late fee involved in those payments. If the timing is such that you still need that help, call them at 791.3242, or email the request to TW_Web1@tucsonaz.gov. Our always-reliable friends at the Tucson Zoological Society announced that the zoo is providing free admission to Federal employees affected by the government shutdown. Other zoos around the country joined us in offering that service – Columbus Zoo, Miami Zoo, Point Defiance Zoo, Central Florida Zoo, Indianapolis Zoo, Oklahoma City Zoo, Oregon Zoo, Hogle Zoo, Brookfield Zoo, San Francisco Zoo, Pittsburgh Zoo and more. While I am on the zoo item, get ready for the upcoming Tucson Chinese Cultural Center lantern display as it makes its way through Southern Arizona. The TZS is collaborating with the Confucius Institute over at the University of Arizona, and the Tianyu Arts & Culture group in presenting this exhibit. They will have over 40 large, customized lanterns at the zoo from February 2nd through March 23rd. The exhibit will also include Asian cuisine, Chinese name writing, calligraphy, painting…lots to go along with the lanterns. Go to the zoo website for more details @ www.reidparkzoo.org. I say often that the two most important issues we deal with at the M&C are budget and water security. I am going to hit them both this week. One of the budget items we are considering is moving from using an outside insurance carrier to becoming self-insured. The difference is a hoped-for savings on administrative costs. Staff is still pulling together the actual amount of savings, but they will be considerable if we manage the program well. There has been some confusion among employees about exactly what this will mean to coverage. We are not talking about changing the terms of the Plan. Moving to self-insured is a way of addressing funding, not benefits. We will have more flexibility in defining covered benefits later on, but right now all we’re talking about is administering the program with our own third party partner, or joining an existing trust. That has still to be decided. Currently, we pay a premium to our carrier and they handle all of the administration, and establish the terms of coverage. Right now, we are the only large employer in the State that is not self-insured. Some employers are members of trusts in which they pool with others to create economies of scale. We are considering joining such a group, but for now the idea is to go it alone and see if the demographics of our employee/retiree pool matches up with others over time, leaving the trust pool as an option for later. Such a group could include counties, other cities, school districts or even transportation authorities. Some have been joined at the hip since the early 1990’s, so they have a track record to build from. While leveraging our buying power in the market is one major benefit of joining a pool, the downside is that we would have one vote among the group. Similar to our 1:9 ratio in the current RTA voting structure, our voice would be diluted, not based on the number of employees we bring into the group, but simply as one voting entity among the rest. Since we have more purchasing power than other local large employers do, going to a one-vote-among-many situation is something we will have to weigh closely. In order to get started, we need to set up a fund that will serve as seed money – beginning to build a reserve so if claims in a given month exceed premiums collected from employees, we have a backstop to protect the General Fund. Our ultimate goal is a $10M reserve pool. To get started, we are looking at a beginning reserve of $5M. We will be including this discussion in with our budget talks as they move forward throughout the spring. Monday (today) we’re holding our first budget retreat of the year. In it, we will talk about the benefits and risks of going self-insured, and we will start talking about our general revenue and expense projections for the upcoming fiscal year. As most of you know, we are in a much more solvent position now than we were just eight years ago. That is a testament to good money management, and to sacrifices, the entire community has made helping us get to this point. Thanks to you all for your support as we worked through the post-recession challenges. Last Wednesday evening, Crystal and I joined some of our Tucson Water management in addressing the Broadway/Broadmoor neighborhood on the topic of water. The two main topics were capacity and cleanliness. I will review a little on both here. That is Lake Mead. You have seen similar photos in the newsletter before. It shows how far the water levels have dropped over time. I have written a lot about the Drought Contingency Plan (DCP) that is being negotiated on a multi-state and international level. We are now down to crunch time. If the State of Arizona does not get its internal act together by January 31st, the Bureau of Reclamation has announced that the feds will step in and impose a solution. What is on the table is who gets what allocation of the Colorado River water. Many of us believe it would be better to figure that out for ourselves than to have Uncle Sam step in and do it for us. A DCP draft is close to finalization. However, in the past week, State House Speaker Rusty Bowers dropped HB2476. It is a Bill that gives Safford Valley agriculture interests the ability to take water the Gila River Indian Community says is theirs, despite the fact the GRIC has a 2017 9th Circuit Court ruling on their side. That decision was essentially a ‘use it or lose it’ ruling, and by that ruling, the agricultural interests Bowers is trying to protect lost their rights to the water they are now trying to claim. The tribe is key to the DCP. The State is relying on them for 500,000 acre-feet of water that will be used to spread around to other users who are being negatively affected by the terms of the drought plan. If the Indian community pulls out of the deal, it falls apart. If Bowers pushes forward with his bill, they pull out. January 31st is not moving. I am not a fan of all the terms contained in the DCP. It says very little, if anything about forcing conservation. The water rights that are granted under current law exceed the capacity of the river, and simply allowing agriculture interests to dig more wells hurts the groundwater levels. Even the DCP is a stopgap agreement, but without it we will be told by the Federal government how to manage our water supply. We will see in the next few days what changes up in Phoenix. I know there are some in the State Legislature who would welcome a fight with the Feds. It is back to the same story of the Legislature wanting to exert their sovereignty, but also wanting to impose their will on Cities when we assert our independence from them. Lots of hypocrisy going on and in this case our water agreement is at risk. Stay tuned – this will all be sorted out sometime this week. The water cleanliness piece relates to the ongoing PFC product liability litigation, about which I have written. This is the contamination we can trace to work out at Davis-Monthan that, by their own admission resulted from chemicals being hosed off planes and dumped into the soil and sewer system. Tucson Water officials are continuing to gather data and work with the military in an effort to make sure any contamination is contained. During our Wednesday meeting with the Broadway/Broadmoor folks, our water officials made a strong case asserting that we are in fact out ahead of the plume. That is good news. The direction I have advocated is that we rely on documents we have access to that clearly show the product manufacturers (3M, and others) knew decades ago that the PFCs they were selling were toxic and needed strong controls built into their handling and distribution. Those controls were severely lacking. Others suggest we should be pursuing litigation against the military. We have not eliminated that option. It is just not our first approach. The military is not unscathed in this. In fact, last week a bi-partisan group of Representatives formed a task force intended to address the nationwide contamination of water by chemicals that have been used by military bases. A Republican from Michigan leads the group that includes Democrats from Pennsylvania. The group is forming in an effort to compel the EPA to designate PFAs a hazardous substance, and to regulate levels that can appear in drinking water. Right now, all the EPA has done is set a Health Advisory level. The difference between a Maximum Contaminant Level (MCL) and an advisory guideline is that the MCL would apply nationwide, and it would bring new sources of funding to the table for cleanup and remediation. The task force is also asking the Centers for Disease Control to start looking at funding for cleaning up the problem. Over 200 military bases across the nation have had to stop using the product (AFFF) that is causing all the contamination. In a 2017 article in The Intelligencer, Kyle Bagentose demonstrated that the military knew in at least 2001 that the firefighting foams they were using could break down into toxic chemicals, and that those entered streams and groundwater at several military bases. It is what caused us to shut down three wells out by DM. Philly law firm Williams Cuker Berezofsky is suing the Feds over groundwater contamination. Their lead attorney produced 170 documents that totaled more than 3,100 pages and spanned over three decades. Very much like the documents related to 3M, these make it clear the Defense Department also knew the products endangered humans and the environment. After 3M stopped producing AFFF, the military began scrambling to find modified versions of the foam since they considered it to be an essential safety tool for the bases. However, they also knew it was getting into water systems. I clipped this portion of a letter written by one of DuPont’s business managers. They are a manufacturer of one of the modified products. In the first paragraph, they make it clear they are concerned about the availability of AFFF if production is stopped, and in the second paragraph, they admit to knowing it is disbursed into the groundwater. We will stick with our litigation against the product manufacturers, but as other lawsuits unfold, we of course continue to have the ability to include other defendants in our effort. The good news is that the contamination levels we are seeing locally are far below the EPA health advisory limits. In this table, the EPA level is the solid red line at the top. The dashed line below that is the limit we have self-imposed. The green line near the bottom is what we are detecting at our treatment plant. It demonstrates the good management our Tucson Water staff has in place. Our partners at the University of Arizona’s Water Research Resource Center are hosting a Chocolate Fest. This group coined the phrase Arizona Runs on Water. Stop by their event and pick some of the brains who know about water supply and challenges. They will be unveiling photo contest winners, which will be the entertaining part of the event. However, I know many will be happy to engage and answer your water-related questions while you dine on their chocolate goodies. The event will be held on Friday, February 15th from 3:30 until 5pm. The WRRC is located at 350 N. Campbell. First, the Pima Association of Governments (PAG) is inviting the public to provide some input on their priorities as they relate to public transit. They have a brief transit survey available on their website. It only takes about 5 minutes to complete. If you would like to get your thoughts known and on their record, you can access the survey at this link: www.pagregion.com/transitsurvey. In addition, the City is partnering with PAG in gathering transit-related input. Passenger onboard surveys are being collected on all routes through March. We have contracted surveyors who will be on board all bus, streetcar and shuttle routes collecting the data. The goal is to understand the role transit plays in riders’ lives. You will be able to identify surveyors by looking for folks wearing blue vests with I.D. badges. You would find the same 5-minute investment on the PAG site. After reading my newsletters, you should recognize that logo by now. We finally saw a draft of the Complete Streets policies that we will be voting on later this year. Honestly, I was disappointed that the draft we approved did not contain more specific design elements, but those will come. The draft did include some citizen committees that will be formed to help put the design standards together. The committees will be comprised of multiple skill sets and interests, and the composition is yet to be decided. I know others on the Mayor and Council agree that we want to avoid being bogged down in process and never end up with a product. We should see staff’s response to that input in March when we move the draft manual along. Complete Streets are design standards that are context sensitive – design set to match the surrounding area. For example, we would clearly not want to try to impose the same sorts of criteria for both Houghton Road and 4th Avenue. What we see will be options for inclusion in our roadway design. Certainly, we will be moving to a less car-centric design model, towards one that embraces multiple modes of getting around with cars, of course, and also buses, walking and biking. In that way, we will be able to talk productively about the sorts of destination neighborhood commercial nodes many of us have been advocating for along the Sunshine Mile. I expect Project for Public Spaces (PPS), the group working with Rio Nuevo on the Broadway design, will come in with some proposals that’ll fit very nicely in a Complete Streets policy guide. We will hear from PPS before the Complete Streets policies are finally adopted. Getting our roadways and adjacent right-of-ways designed with multiple uses in mind should not cause budget creep. It is simply a different emphasis; multiple uses vs. asphalt. Having this in place, and having RTA buy-into the design standards would have saved a lot of heartburn during the Broadway widening talks. We will salvage some good things from that, and bring the full new policy standards around later this year. When we received bids on the final segment of the Downtown Links, they were several million dollars above budget. Staff took a stab at working with contractors and shaving costs from the design scope. Some recommendations were presented in a public open house last week. I think they are headed in a good direction. The full Links project is a $76M RTA job that serves as a by-pass around downtown. It does include some of what may be considered Complete Streets elements: sidewalks, bike lanes, separated multi-use path, public open spaces, native desert landscaping and water harvesting elements. It will also include an underpass at the 6th Street Union Pacific crossing and a popular Deck Plaza serving as a community gathering space. It was the Deck Plaza people have been passionate about preserving through the rescoping of the project. In order to help reduce project costs, the design team has planned changes in some of the structural elements at the 6th Street crossing, making some aesthetic modifications on retaining walls and allowing for road closures to help with the construction of the bridge. There have also been changes to the Deck Plaza, but in ways that both help with costs, and that preserve the intent of the Plaza. This graphic shows the side-by-side, before and now-planned Deck Plaza modifications. Some major cost savings were achieved by pulling the Plaza’s west boundary in, and extending the footprint to the east. The cost savings by making the change to the structure needed on the above-grade western part of the Plaza were considerable, and the total square footage of the Plaza area has increased by a couple thousand square feet. It was a good solution, preserving both the design and use intent of the Plaza. A Request for Qualifications (RFQ) was sent out a couple of weeks ago. That will result in selection of a contractor with whom cost negotiations will continue. That pre-construction phase will last through this year. We will have another public outreach around the end of the year to finalize how all this sorts out. If you would like to follow along, you can go to the project website at www.downtownlinks.info, or call the Project Information Line at 622.9000. This is sort of transportation-related. Tucson Parks and Rec is hosting a Super Sprint Triathlon. It will include a 350-yard swim, followed by a 6-mile bike ride and a 1.5-mile run. It is being marketed as non-competitive, but I know there will be plenty who want to compete, at least against themselves. The space for taking part is limited, so register soon if you want to participate. The event will be held at the Clements Center – Ward 4, so Shirley should certainly be among the competitors. The Center is located at 8155 E. Poinciana Drive. It will be held on March 3rd, but register now if you want to do it. You need to be 12 years or older. Register on line at www.EZEEreg.com or call them at 791-4877 to get your questions answered. If you are a local business that would like to become a sponsor of the event, call Sierra Boyer at 837.8032 and she will get you signed onto the event. If you join, don’t forget to also join the Moon Walk. We are closing in on the 238,000-mile goal. Your triathlon miles all count. Here’s the link to sign up: www.meetmeatmaynards.com. Walter is a Golden Retriever purchased at Animal Kingdom. The owner of the store is one of the people who lobbied hard to get the State to pass its pre-emption law so we could not restrict puppy mill bred animals from being sold in retail establishments. Walter had to be surrendered by his family to a Tucson Rescue because they could no longer afford the vet bills related to his hip problems. Had he not been the product of in-breeding at a puppy mill, none of that would have been necessary. The State Legislature is now considering a Bill, HB2329, which will relieve families of the financial burden, in cases like Walter’s, and place them back on the store that was responsible for enabling mills to continue flourishing. The Bill is a consumer safety measure, and it has the support of the Humane Society U.S., as well as Rescues, Shelters and animal welfare advocates across the State. This is a redline of the changes in current law that are being proposed by the Bill. We are hoping the Bill will be assigned to the Public Safety Committee. Note the change, so that the family is reimbursed wholly, for vet bills and not just the original purchase price. Fair’s fair. If a retailer is willing to work with puppy mills, they should suffer the consequences of that inhumane choice. It is just too bad the animals still suffer. Section 44-1799.11 is the pre-emption statute preventing us from making our own law on the topic of puppy mills. Of course the Chamber of Commerce and Animal Kingdom are already gearing up to oppose the Bill, but if it can get a fair hearing in Committee, light will once again be shed on the conditions animals are subjected to in mills. Hopefully, hearts and minds will be moved up in Phoenix and the lobbying tactics by the retailers won’t prevail this time. If it passes intact, I will be bringing our original puppy mill ordinance back to M&C for consideration. I opened the newsletter with a piece celebrating boomer moms. In the obituary I wrote for my mom, I indicated that her wish was any gifts offered after her passing went to the Tucson Audubon Society. They are my Local Tucson this week. That is a tile my mom made and donated to the Audubon. It’s hanging down at their place. Every Wednesday they host field trips out at the Sweetwater Wetlands for birdwatching. Birders of all experience levels are welcome. Just take binoculars, some water and clothes to do some light hiking in. Meet at 8am out at 2511 W. Sweetwater Drive. To learn more about their work, and their programs, check the website at www.tucsonaudubon.org. Or you may call at 629.0510. He is not a suspect. They know he killed the five women.